Travelers (front, L to R) Beth Frack, Bray Barto, Jozy Unal, Jordan Shegog, Cashlyn Lovell, (back) Parker Lovell, Shannon Barto, Don Shegog, Daniel Shegog, Chris Hawley & Medge Owen. Don Shegog and his son Daniel are forgoing the Thanksgiving traditions of food, family and fun this year. They are a world away, enriching the lives of the people of Ghana. Shegog said Daniel convinced him to take part after the 12-year-old heard a presentation at school about another service trip to Ghana students took to aid a different school – Fayef International in Kokobrite. 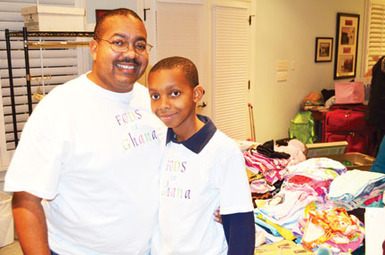 The younger Shegog became preoccupied with helping Ghanaian kids, so much so that he asked his dad and mom (Wake Forest Baptist Health’s Dr. Jamehl Demons Shegog) to donate to the cause in lieu of giving him Christmas gifts. Daniel said he was moved by the Ghanian students’ unwavering dedication to learning and their lack of technology, electricity and running water. He is ecstatic that he and his dad are taking an active role in helping to make a difference in their lives. The Bridge Project evolved out of the work of Dr. Medge Owen, an obstetrician professor at Wake Forest Medical School, who, through her nonprofit Kybele, recruits other obstetricians to train doctors and other medical professionals in impoverished nations around the world. Owen’s efforts have greatly reduced the number of mothers and babies who die during childbirth. During one of her Kybele-related trips to Ghana, Owen saw that the schools were sorely lacking essentials. She raised money to have a computer lab and outhouse built at Fayef International School, and last year, she took her daughter, Jozy Unal, and a group of Forsyth Country Day students to the school to install the lab’s computers, which FCD, an acclaimed Lewisville-based pre-K through 12 private school, donated. It was Owen who gave the presentation at FCD that so enamored Daniel. After her talk, she often saw Daniel making a beeline to her when she’d pick Jozy up from school. He’d always want to talk about Ghana. Shegog, a former FCD computer teacher, served as an advisor for the first trip, helping student Chris Hawley select the computer equipment the school donated. Owen said she expected the trip to go smoothly. Ghana is politically stable, and English is the primary language. She said the students she took last year took to the Ghanaian students immediately. “The kids were like magnets to each other. There was no barrier of color, no barrier of poverty or wealth; it was just kid on kid,” she said. The group will stay at Ghana Health Services, which will also provide them with transportation and food. Owen, whose Kybele work acquainted her with the organization, worked out the arrangements. 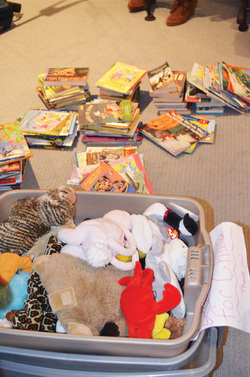 Locals have already donated several hundred pounds of books to Odoi Atsem. They, like the computer lab, will occupy the school’s new library, which was constructed with Bridge Project funds. The group has also funded efforts to bring running water and electricity to the school and purchased laptops for the computer lab. The team of volunteers who departed last week, stuffed their luggage with clothing, Beanie Babies, school supplies and books for Oboi Atsem students. 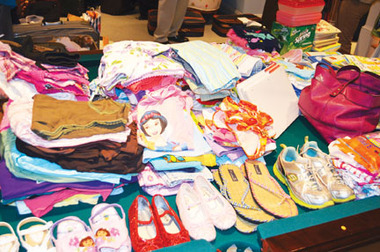 In addition to individual donations, the Bridge Project held a yard sale to raise funds and turned to fundraising site Indeogogo. Local nonprofits have also chipped in. They included Hopscotch Adoptions and Lovell’s Little Bits, the non-profit wing of Cash Lovell Stables, whose owner, Parker Lovell, is returning to Ghana with daughter Cashlyn after taking part in last year’s effort. FCD students were expected to use the live video chatting service Skype Monday to communicate with their classmates and Oboi Atsem students. FCD music teacher Beth Frack, who is among the group of volunteers, was also slated to conduct a song performed simultaneously by Odoi Atsem and FCD students in Lewisville. Aside from their work at Odoi Atsem, the group of volunteers are scheduled to visit Fayef International, a local chieftain, and the slave castles along the Ghanaian coast. The Shegogs say they will miss their family and the traditions of Thanksgiving; however, they believe this opportunity is well worth the sacrifice. “I’m looking forward to it because it’s a completely different way of giving thanks and honoring all that I’ve been given and giving back to others,” Shegog said. For more information, visit www.thebridgeproject.us.